During a ceremony held Thursday at the historic Strand Theatre in downtown Delaware, a plaque honoring Peter and Georgia Manos was unveiled outside the cinema’s Main Theater. 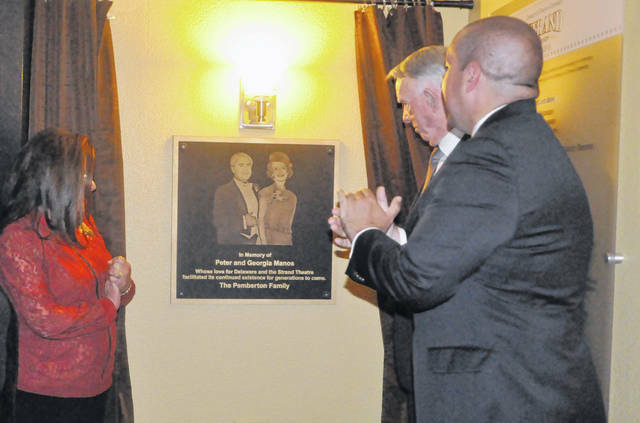 Pictured moments after the unveiling are, left to right, Joni Manos Brown (daughter of Peter and Georgia Manos), David L. Pemberton Sr. (plaque benefactor) and Joe Pemberton (Strand Board of Directors VP). The Strand Theatre is honoring the memories and community contributions of Peter J. and Georgia A. Manos with the installation of a bronze plaque outside the cinema’s Main Theater. The plaque was graciously donated by David L. Pemberton Sr. and his wife, MaryAnn, who were friends with Peter and Georgia Manos throughout their lives. All shared a love of watching movies at the Strand, 28 E. Winter St., Delaware. Mr. Pemberton graduated from The Ohio State University College of Law and was admitted to practice before the Supreme Court of Ohio in 1966. Also a lawyer, Peter Manos was born Jan. 17, 1922, in Lynn, Massachusetts. Before he attended school, he served as a lieutenant junior grade in the U.S. Navy, stationed in Guam during World War II. He graduated from Ohio Wesleyan University in 1947, and then he attended Brown University, Harvard Graduate School of Business, and Capital University, where he earned his law degree. In 1951, he met and married Georgia Vatsures and established his iconic law firm – today known as Manos, Martin, and Pergram. Mr. Manos was very active in the community. He was the founding president of Kiwanis Club of Delaware, established the Delaware County Foundation, worked with United Way, Red Cross, and Delaware Speech and Hearing, and was an associate of Ohio Wesleyan and the Delaware County Cultural Arts Center (the Arts Castle). Georgia Manos was born Oct. 12, 1923, in Delaware. She graduated from Willis High School and attended The Ohio State University. Mrs. Manos worked at Buns, Nectar Candyland, Lazarus and Manos Law Office. She was also very active in community service, cofounding the Delaware County Foundation with her husband. She volunteered at St. Peter’s Episcopal Church, Grady Memorial Hospital, United Way and Red Cross. In addition, she was an OSU Hospitals Service Board Charter and Lifetime member. Philanthropy runs in the Manos family. Daughter Joni Manos Brown, former Strand Board of Directors president, and her family, recently sponsored the renaming of the Strand’s Balcony Theater to the Brown Family Generations Theater. The new name is a dedication to all of the children who have taken part in the Strand’s Free Summer Kids Series, giving back to the community. The Strand is owned and operated by the Strand Theatre and Cultural Arts Association with a mission that includes working “to foster the public’s appreciation of films & historic movie theaters as part of the American culture.” As a nonprofit, the Strand relies on community and donor support, grants and sponsorships, and governmental support to fund improvements made to the theatre. Improvements to all three theaters, as well as the renovation of restrooms, marquee repair, a new building façade, and HVAC and boiler units, are examples of repairs made in recent years. The iconic, nonprofit Strand Theatre is celebrating its 102nd year in operation. It is one of the 10 longest-operating theatres in the United States and one of the few remaining independent theatres showing first-run films. Estimated to have an economic impact of $1 million annually, the Strand serves 75,000 patrons per year and is open 364 days a year. Learn more at www.thestrandtheatre.net.